A large statue, made of Galilee stone, was sculpted by the sculptor Daniel Kafri of Jerusalem between the years 1973-1975. The statue stands at the top of the Peak Park in Old Jaffa. The statue, of two 4 meter tall pillars upon which rests a stone, also 4 meters in length, resembles a gate. 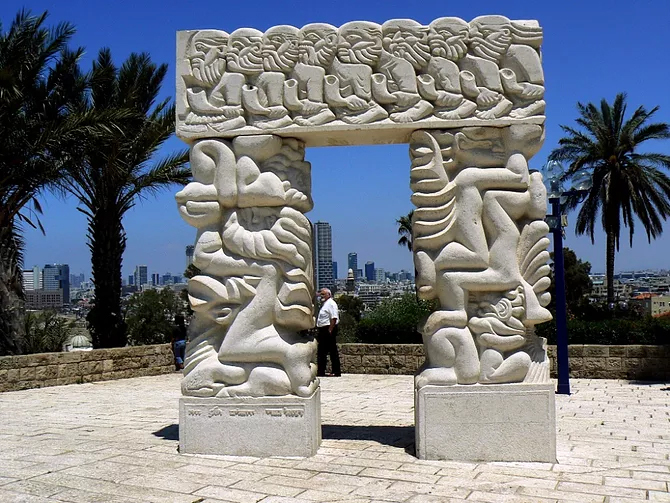 The sculpted gate is the gate of entry to the Land of Israel, and represents the promise of the land to the Patriarchs – Abraham, Isaac, and Jacob. On the two pillars appear the three Patriarchs – who received the promise – and the top stone signifies the beginning of that promise’s realization via the capture of Jericho and the Land of Israel by Joshua. The first pillar recounts the tale of the binding of Isaac. This is an extraordinary portrayal of the binding – Abraham is seen kneeling on the ram, and holding up his son Isaac. Isaac lies with his face, resembling Abraham’s, turned upward. The second pillar depicts Jacob’s dream, where the land was promised to his offspring. Jacob rests on the land and the stone is under his head. Above him are two angels, one ascending and one descending, facing opposite directions, and the rhythm of the wings creates an association with a ladder. The top beam represents the realization and depicts the capture of Jericho. 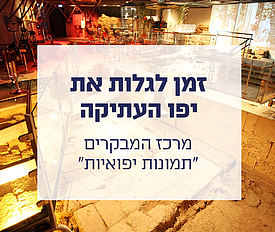 The priests surround the city of Jericho, holding horns and are seen carrying the Ark of the Covenant.